So my friends at paulfredrick.com sent this lovely article to me and I thought it wise to share it here. 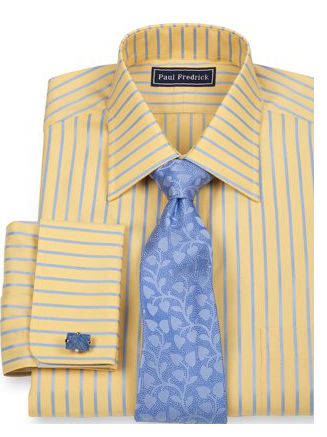 Paul Fredrick as you know offers an entire collection of polished, relevant wardrobe options to men who have come to rely on them for all of their business wardrobe needs. They design, manufacture and directly distribute every item in their collection. No wholesalers. No store fronts. Just great style at everyday prices. With the polar vortex (hopefully) behind us and spring approaching, it’s time to update your wardrobes accordingly. 2014’s spring fashion is balanced between bold and subdued, modern and retro–making it simple to keep with the times while staying true to your personality. Here are some key style trends to keep in mind as you revamp your wardrobe for the changing weather. Many designers are looking to the casual styles of the 1940s and 1950s for inspiration. Think peak lapels, spread collars and high-waisted, pleated trousers. Men’s suits are beginning to move away from the ultra-slim cuts of recent years. This spring sees suits fitting more loosely, with softer lines and a more relaxed appearance. Floral patterns are shaping up to be one of the dominant trends this spring. While an outrageous floral blazer and accompanying pants might not be work appropriate, you can add a touch of springtime style to your outfit with a floral-print tie. Flowers aren’t the only pattern that’s in this season. If you want something a little less flamboyant, plaid and checked blazers are an equally stylish option. A windowpane jacket can bring a measure of colorful flare. Fans of classic style rejoice: the double-breasted blazer continues its a comeback. Ideal for taller men but appropriate for just about anybody, the double-breasted blazer is virtually guaranteed to catch the eye. The ubiquity of iPads and other tablets is leading to a proliferation of small bags for men, similar to classic document wallets. Generally they’re made of leather, but this season will see more soft fabrics that can be easily rolled. Traditionally, springtime colors have been lighter, like pastel pinks, purples and grays. While those colors look great, and are always appropriate for this time of year, 2014’s style is slightly muted (outside of the floral prints, of course). Blue in all shades seems to be a color of choice, giving you plenty of options, from a light-blue dress shirt to a navy suit. In a reversal of recent trends toward short-cropped jackets, longer, more weather-appropriate overcoats are coming back in style. 2014’s long coats tend toward the minimalist, with clean lines and few flourishes. Now you can stay comfortable and fashionable during the transition from winter to springtime, a notoriously difficult time of year to dress for. Keeping up with the times can be a daunting task as trends change from season to season. But there’s no need for drastic measures–if you aren’t the type to wear a pink flowered three-piece suit, don’t feel like you need to in order to be stylish. Fashion trends should serve your own personal style, and not the other way around.